If you’re a regular reader of my blog posts, then you know I am pretty passionate about (a) talking up New Rochelle and (b) eating good food. 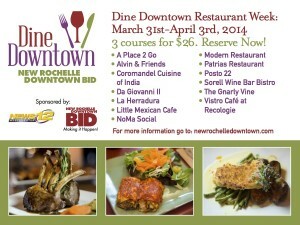 So there aren’t many events that I’m more eager to promote than New Rochelle’s “Dine Downtown” Restaurant Week, starting on March 31st. You can find all the details, as well as links to participating restaurants, on the website for the New Rochelle Business Improvement District. And there’s a handy map on this postcard. If you haven’t yet had the pleasure of dining in downtown New Rochelle, you’re missing a great experience, so come see – and taste – what our town offers.